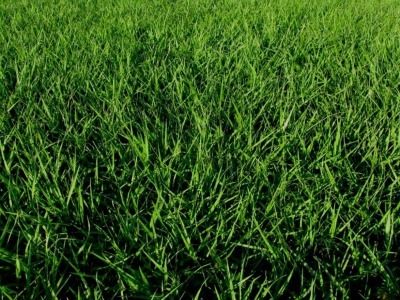 Bahiagrass is a popular choice for lawns in the Gainesville area. While it does not provide the carpet-like, dense lawn that some other types of grass such as floratam, it is very well suited for the sandy soils so prevalent in our area. Introduced from Brail in 1914, bahiagrass was originally used as pasture grass throughout the southeast because of its low maintenance requirements that allows it to do well with limited water and fertilizer. This is possible because of its extensive and deep root system. The low maintenance features make it desirable for home sites on large lots or acreage or for anywhere that there is no irrigation system. Some of the disadvantages if considering bahiagrass include the fact that Bahiagrass forms tall, unsightly seed heads throughout the spring, summer, and fall months that many find objectionable. This necessitates regular mowing to keep the stalks from becoming too tall. The seed stems are tough and can wear out mower blades, requiring them to be sharpened frequently. It also does not have good tolerance for shade, traffic, or saltwater. As with any type of grass, proper lawn mowing practices are necessary to keep bahiagrass healthy and attractive. During times of active growth, bahiagrass should be mowed every 7–14 days at a height of 3–4 inches. The higher mowing height promotes a deeper, more extensive root system that makes the grass more stress tolerant. Do not remove more than 1/3 of the height of the leaf blades at any one. Clippings should be left on the ground after mowing. They do not contribute to thatch buildup, as is often assumed, but are actually readily degraded by microorganisms. They also provide a source of nutrients to the lawn and can reduce fertility requirements if regularly left on the lawn. Bahiagrass can survive for extended periods without water, but it goes into a drought-induced dormancy, during which it turns brown and does not grow. To keep it green and growing, irrigation is needed when leaf blades begin to fold up, wilt, or turn blue-gray in color, or when footprints remain visible after walking on the grass. Be sure to follow any local watering restrictions. Bahiagrass has the ability to generally recover from severe drought injury soon after receiving water from either rain or irrigation. For professional mowing service of your bahiagrass lawn or any other type of grass in the Gainesville area call us at 352-682-4444 or use the convenient “Contact” form on our website.